PAUL DERVAN: End of the 'big idea' in advertising? End of the 'big idea' in advertising? 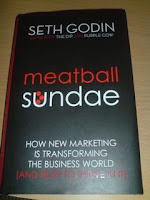 In his latest book, Seth Godin talks about 'new marketing' and the end of the 'big idea' in advertising. He explains that advertising ideas worked great when advertising was in charge - but this is no longer the case. Big ideas still exist but they are part of the product or experience, not just the advertising. Surely Nike+ is a big idea in every definition of 'new marketing'? It brings together two great brands, incorporates digital and the off-line world seamlessly, and produces something really new, exciting and useful for people who love to run. Combined, these add up to a pretty good reason to choose Nike runners over Asics, Adidas or any of the other brands. And the tv advertising around Nike+ is actually great. How could it not be with brands like Apple and Nike working together? And this is the point - when people talk about the brand (Nike+) I suspect it is not the ads they talk about, it's the product. I'm sure there is still a place for advertising ideas but can brands be built on them alone anymore?